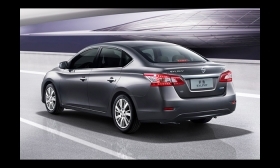 The Nissan Sylphy -- introduced at the Beijing auto show in April -- previews the all-new 2013 Sentra due this fall. NASHVILLE -- Nissan North America, struggling to keep pace with demand in Mexico and setting ambitious sales targets for the next-generation Sentra, said today it will build the 2013 Sentra at a second North American site, in Canton, Miss. The automaker told employees at the Mississippi plant that it will add 600 workers there, boosting the factory's work force to 4,500, to launch the next-generation Sentra late this year. The compact car will be redesigned for the 2013 model year and Nissan officials hope it will be a more serious rival to the segment leaders: the Toyota Corolla and Honda Civic. Those cars routinely outsell the Sentra by roughly a 2-1 ratio. In the United States, Sentra sales have dropped 18 percent this year to 46,773 units through May. In 2011, Nissan sold 114,991 Sentras in the United States, an increase of 22 percent over 2010. Nissan says Sentra production is constrained at its Aguascalientes, Mexico, assembly plant, where the automaker also produces the Versa for sale in the United States, Mexico and other markets. Nissan has been shifting its car and light-truck lineup around plants to accommodate sales growth in Mexico, the United States and Brazil. The company is simultaneously moving the Xterra SUV and Frontier pickup from Smyrna, Tenn., to Canton to make room in Smyrna for production of the Rogue crossover from Japan. The strong yen -- which erodes profits on models exported from Japan -- is forcing Nissan and other Japanese automakers to shift output overseas. Nissan also will begin producing the electric Leaf -- now built in Japan -- in Smyrna later this year. Today's announcement also thickens the plot for labor organizers who have been stirring around Nissan's factory. The Canton plant is nonunion but UAW organizers recently indicated that they have growing support at the operation. The union has not officially declared its intention to organize the plant. Union organizing traditionally has proved difficult when workers perceive that business is expanding and there are new opportunities for advancement.